What Is It That Makes Even ‘Simple' Recipes So Difficult To Follow? So…just how difficult can it be to follow a recipe? It’s a list of ingredients and a set of instructions. Surely as long as you read and follow the instructions carefully you will end up producing a similar looking meal or bake to the photograph? Well actually it really isn’t that simple. Recipes are hard! I thought I would show you just how confusing recipes are by dissecting a fairly simple recipe for Cottage Pie. Then I thought it would be more realistic if I got my husband to read it and give me feedback. But first – let me give you a bit of a background about him so you will realise he is not completely useless in all aspects of life – just in the kitchen! Phil began his working career as an electronics engineer. This meant he left university being totally engrossed in the minute detail of how complicated recording equipment works. 38 years later and he still is an Engineer and has run multi-million pound projects. I’m in awe of what he does on a daily basis – then he walks into the kitchen and his brain just seems to go to mush. I do feel a tiny bit responsible for this situation.  When we first got married it was just simpler, and quicker, for me to take over in the kitchen. It’s not surprising Phil hasn’t built his kitchen skills up. On a positive note when I began creating Easy Spoonfuls Phil was actually the perfect tester. As he had very little experience he would follow the recipes exactly but he understood enough to call out to me if something didn’t make sense. I learnt a lot from his questions. I am absolutely thrilled with how much he loves cooking now – his ability and confidence has rocketed and he actually pesters me to let him cook a meal. I would love it if you wanted to keep in touch and receive occasional hints, tips, information and updates on the Cookery Club. The first issue of my Newsletter also contains access to the Free Content Library. So back to this ‘straightforward’ recipe… Phil could often be heard exclaiming ‘This is why the world needs Easy Spoonfuls, these instructions are SO confusing’ So I asked him to read through this recipe and give me his views on why it was so confusing. 1. Heat 1 tbsp olive oil in a large saucepan and fry 1¼ kg beef mince until browned – you may need to do this in batches. Set aside as it browns. 2. Put the other 2 tbsp olive oil into the pan, add 2 finely chopped onions, 3 chopped carrots and 3 chopped celery sticks and cook on a gentle heat until soft, about 20 mins. 3. Add 2 finely chopped garlic cloves, 3 tbsp plain flour and 1 tbsp tomato purée, increase the heat and cook for a few mins, then return the beef to the pan. 4. Pour over a large glass of red wine, if using, and boil to reduce it slightly before adding the 850ml beef stock, 4 tbsp Worcestershire sauce, a few thyme sprigs and 2 bay leaves. Phil: “So do I use an actual wine glass as glasses come in all different sizes – I would feel happier if I was told exactly how many millilitres of wine to add. Again – vagueness, not good. 5. Bring to a simmer and cook, uncovered, for 45 mins. By this time the gravy should be thick and coating the meat. Check after about 30 mins – if a lot of liquid remains, increase the heat slightly to reduce the gravy a little. Season well, then discard the bay leaves and thyme stalks. 6. Meanwhile, make the mash. In a large saucepan, cover the 1.8kg potatoes which you've peeled and chopped, in salted cold water, bring to the boil and simmer until tender. Phil: “What do you mean ‘meanwhile’….I’ve got this far, the beef is all ready to go. And now you tell me that 45 minutes ago I should’ve started on the mash? 7. Drain well, then allow to steam-dry for a few mins. Mash well with the 225ml milk, 25g butter, and three-quarters of the 200g strong cheddar cheese, then season with freshly grated nutmeg and some salt and pepper. Phil: “Steam Dry?!! What? Do I need a gadget for this, is it like a hairdryer that speeds up the drying process? 8. Spoon the meat into 2 ovenproof dishes. Pipe or spoon on the mash to cover. Sprinkle on the remaining cheese. 9. If eating straight away, heat oven to 220C/200C fan/gas 7 and cook for 25-30 mins, or until the topping is golden. A cottage pie should be a simple, delicious family meal anyone can prepare, but recipes written like this put it out of the reach of many. My Easy Spoonfuls recipes take you visually, step-by-step, through the process giving you detailed instructions in the order you need them in. There is no vagueness, guesswork or having to read the recipe countless times to make sure you haven’t missed a step. 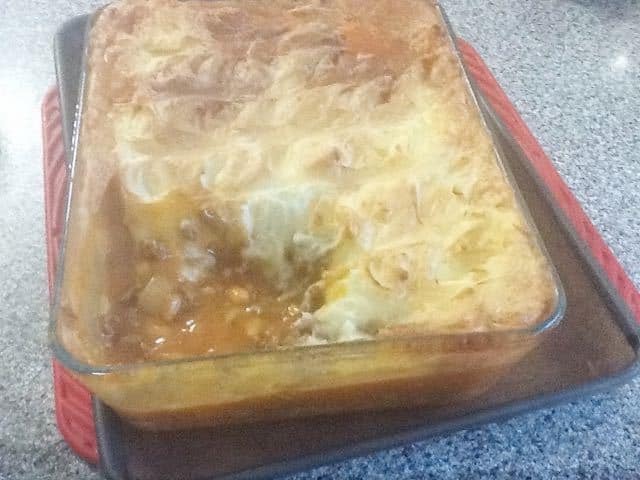 Here are some excerpts from the Easy Spoonfuls Cottage Pie recipe. I hope you've enjoyed reading this. My mission is to help as many people as possible to gain confidence in the kitchen. By clicking the share button below you would be helping me out more than you realise and I would appreciate that gesture so much – thank you!